Russia’s fastest train is the Сапсан (Sapsan) which links Moscow to Saint Petersburg at speeds of up to 250 km/h (155 mph). It entered service in December 2009 on existing railway tracks, which raised safety concerns in the villages along the way. 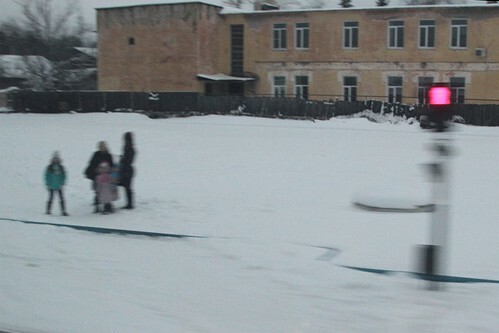 The train only makes limited stops along the way, running express through dozens of minor villages. 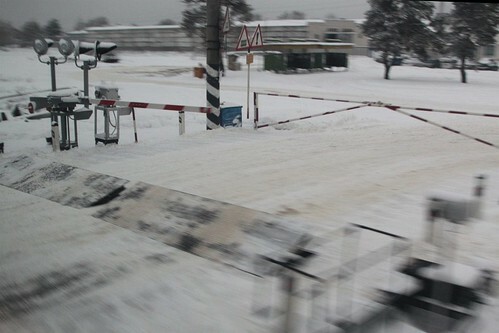 Hundreds of level crossings still exist on the tracks used by the Sapsan, resulting in railway staff having to guard the busier ones as the train passes by. However at other pedestrian crossings, the only warning of approaching trains is a ‘don’t walk’ signal. While on the outskirts of town, it is commonplace to create your own short cut by breaking down the fence. Russia’s luxurious high-speed passenger train running between Moscow and St. Petersburg has killed at least three people, however could be responsible for the deaths of seven, Russian daily Gazeta quoted a senior Interior Ministry official as saying. 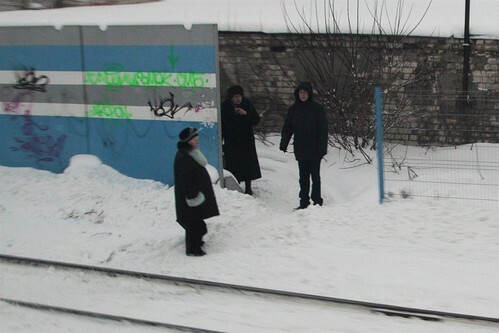 “The deaths occurred when people were crossing rails outside authorized [pedestrian] crossings and failed to hear the silent Sapsan in time,” Gazeta quoted the head of the ministry’s department in charge of transportation safety, Alexander Brevnov as saying. 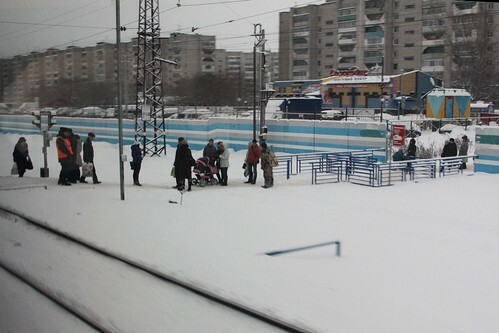 “Unfortunately, people very often violate railway safety and pedestrian crossing rules,” Gazeta quoted Oktyabrskaya railway spokeswoman, Yulia Mineyeva, as saying. In addition, the deaths have sometimes gone unnoticed until the train arrives at the final destination. The law enforcement agencies say that the woman “was crossing the rails in a non-designated area.” Currently investigators are working at the scene trying to establish the identity of the deceased, Interfax reports. “The speed of the train at the moment of the accident was approximately 200 kilometers per hour. The woman was seriously injured,” a source in law enforcement agency told RIA Novosti, Moscow Region. However to protect the Sapsan train from cars and trucks stuck on the tracks, involved safety practices are involved. 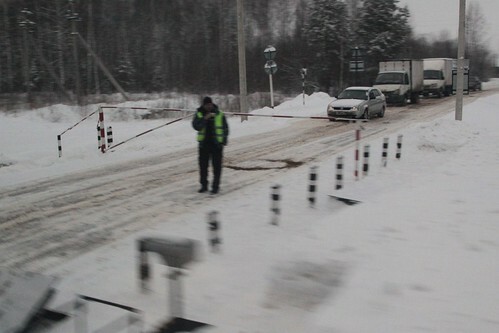 Firstly, the same pop-up steel plates as seen elsewhere in Russia are put into the raised position, to catch any vehicles trying to bypass the boom gates. Secondly, the gatekeeper at each crossing locks an additional set of hand gates across the roadway 15 minutes before the train arrives, to be doubly sure that the level crossing is clear. This leaves road traffic stopped for so long that drivers prefer to get out and wait in the cold, than to stay in their vehicles. The end result is villages full of disgruntled locals. The weekly said the long “railway traffic jams” actually make little towns inaccessible for emergency services and police. As well as a spate of rock throwing targeted at the train. Meanwhile, a few days ago high-speed train Sapsan running between Moscow and St. Petersburg was once again “attacked,” only this time the assailant was arrested. The violator was a teenager. 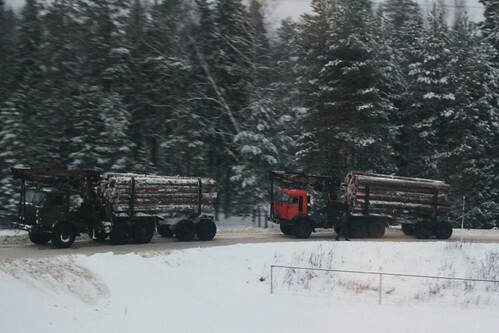 Recently, the head of RR Mr. Yakunin threatened to “identify and catch the attackers” of Sapsan. He reported that 14 such criminal cases were initiated and in the production. Another nine cases were in the decision-making phase, while one person has already been convicted of vandalism. Many have tried to explain the motivation behind the vandals – the New York Times tells of a Russia left behind. 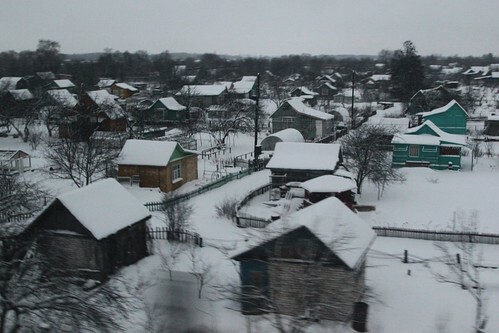 A few times every day, the high-speed train between St. Petersburg and Moscow barrels through the threadbare town of Lyuban. When word gets out that the head of Russia’s state railway company — a close friend of President Vladimir V. Putin — is aboard, the station’s employees line up on the platform standing at attention, saluting Russia’s modernization for the seconds it takes the train to fly through. Whoosh. However Pravda says there is a much simpler explanation. Earlier, media outlets, including foreign ones, tried to figure out why Sapsan was being rejected by residents of Tver, Novgorod and Leningrad regions. They found out that “class struggle” of the poor against the rich had nothing to do with it. In 2011 German broadcaster Deutsche Welle produced an English-language piece on the Sapsan train and the impact on the villages that it speeds past. In addition, French news magazine L’Express published a piece titled “Le TGV russe, symbole d’un pays à deux vitesses” (Russian high-speed train, symbol of a two-speed country) in 2010. And in 2014 S Klesova published a paper titled Traffic Safety at Railway Crossings of High Speed Sections of Railways. Route used by high speed trains. 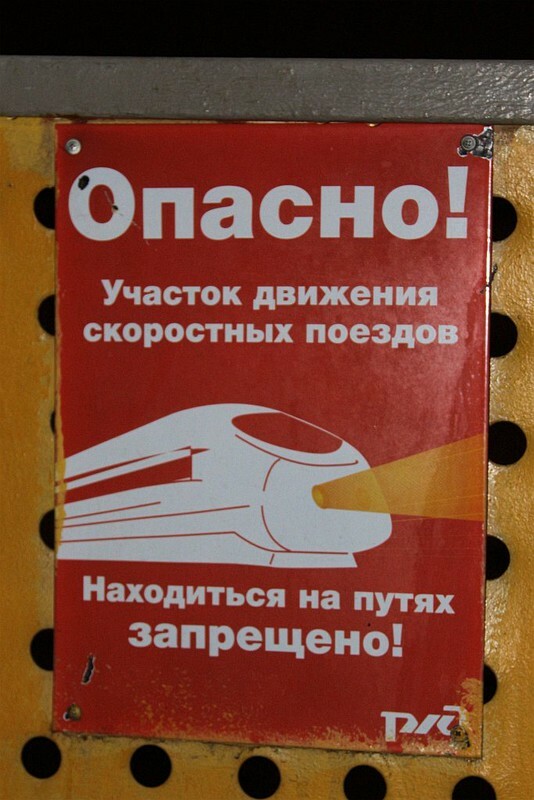 This entry was posted in Trains and tagged level crossings, Russia, Russian Railways, safety, Sapsan. Bookmark the permalink.